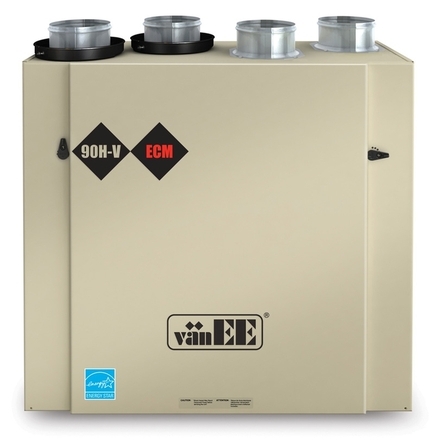 The 90H-V ECM ERV energy recovery ventilator incorporates extremely high performance motors, equivalent, in power consumption, to a compact fluorescent bulb (13.5 watts each), This significantly lowers energy costs while affecting their high performance. So what is the difference between a Heat Recovery Ventilator and an Energy Recovery Ventilator? In short, an Energy Recovery Core absorbs both heat and moisture from the air streams passing through it (without mixing). In the summer, the heat and humidity of the outdoor fresh air is transferred to the exhaust air stream, meaning your home stays cooler inside. In the winter, the opposite is true. This balanced system offers superior indoor air quality and excess humidity control. 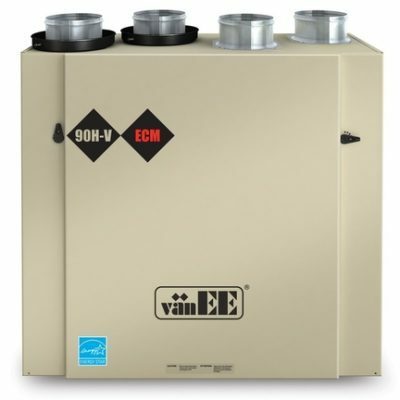 When combined with the state-of-the-art programmable PLATINUM wall control, the 90H-V ECM ERV surpasses energy-saving standards while providing effective energy recovery and ventilation.